Noga Albalach was born in Petah Tikva, Israel, in 1971 and now lives in Tel Aviv. She received an MA in economics from Tel Aviv University and worked for several years as an equity analyst. In 2005, she left this field and started studying literature. 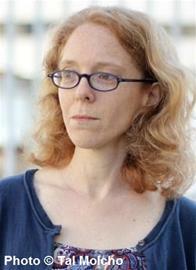 She received her MA in literature from Tel Aviv University and at present she works as literary editor. Albalach has published a novel, collections of short stories and novellas as well as books for children. She has been awarded the Ministry of Culture Prize for Debut Literature (2011)ת the Prime Minister's Prize (2016) and the Brenner prize for "The Old Man" (2018).